Devan Marano shares her personal story at the Overdose Awareness Day observance in Newburgh. 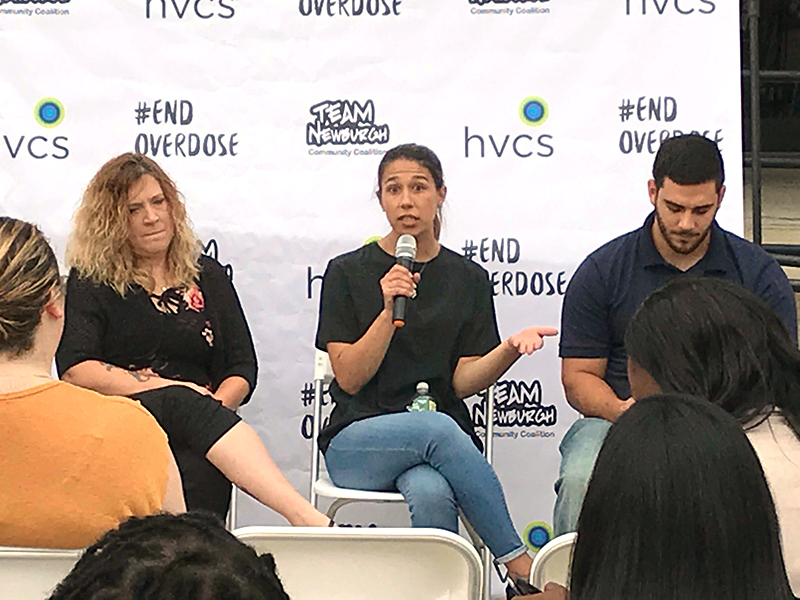 On Friday, August 31, 2018, Hudson Valley Community Services partnered with Catholic Charities’ TEAM Newburgh to hold a local observance of International Overdose Awareness Day in front of HVCS’ Newburgh office. International Overdose Awareness Day is an annual global event held on August 31st which aims to raise awareness of overdose and reduce the stigma of a drug-related death. It also acknowledges the grief felt by families and friends remembering those who have died or had a permanent injury as a result of drug overdose. International Overdose Awareness Day spreads the message that the tragedy of overdose death is preventable. The opioid/heroin addiction crisis has had a profound impact on the Hudson Valley over the past few years. In 2016, 367 residents died from opioid overdoses according to the New York State Heroin and Opioid Task Force, and available data on the first three quarters of 2017 suggests similar totals for last year. The epidemic has had a lasting impact on friends, families and neighborhoods—not to mention those who struggle with addiction. HVCS, other healthcare and social support agencies, law enforcement, and local governments have committed resources to prevent overdose deaths, increase the number of residents who seek help for their addiction disorders, and stem the tide of this epidemic. This event was an opportunity to honor and remember those we have lost to addiction disorders via overdose, and continue to educate the community on available resources. 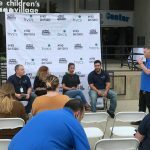 The Hudson Valley’s International Overdose Awareness Day event featured a forum for personal experience speakers, Narcan trainings, educational opportunities, tributes to those lost to overdose, a social media awareness wall, activities to engage children and youth, and free snacks. Dawn Wilkins from TEAM Newburgh shared stats and data about the local opioid pandemic. 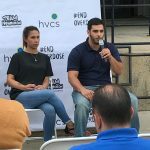 HVCS’ Frank Barone shared his personal experiences with addiction. Andrew Reid moderated the panel discussion. 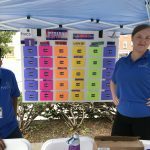 Jovanny and Stephanie offered up HIV prevention trivia at one of the information booths. This entry was posted on Tuesday, September 4th, 2018 at 7:39 pm	and is filed under News. You can follow any responses to this entry through the RSS 2.0 feed. You can leave a response, or trackback from your own site.